Welcome to our Florida State Facts section, part of an educational project designed to provide information about indigenous people in different U.S. states. 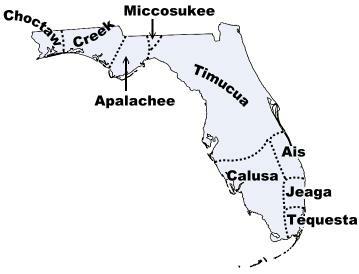 Follow the links to the right of our tribal map for more information about the language, culture and history of each Florida tribe, or scroll below the map for Florida Indian activities including a wordsearch, fact sheets, and words from the Native American languages of Florida. Feel free to print any of these materials out for classroom use! There are two federally recognized Indian tribes in Florida today. The Seminole Nation has five different reservations in Florida, but all of them are governed by the same tribe. Big Cypress Indian Reservation is the largest, but the Hollywood Reservation is where the seat of the Seminole government is located. Florida Tribes Word Search: Printable puzzle hiding the names of Florida's Indian tribes. Florida Language Greetings: Learn to say "hello" in several Native Florida languages. Florida Native Animals: Learn the Native American names of Florida animals. Florida Indian Facts for Kids: Answers to frequently asked questions about the tribes of Florida. We currently have pages for the Appalachee, Calusa, Choctaw, Creek, Miccosukee, and Appalachee tribes. A good book on the pre-Seminole tribes of Florida for kids. Two more kids' books about Florida's Native American history and culture. An excellent history of the native peoples of Florida. Thorough reference book about the Native American tribes of Florida. Well-written history of the Florida Seminoles. Readable book on Native American archaeology in Florida. Books of photographs and information about artifacts and ancient history from the Florida Indian tribes. The native etymology of present-day place-names in Florida. Two good books about the history of the Seminole tribe in southern Florida. 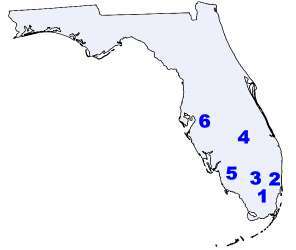 Historic Florida Indians: Information on the pre-Seminole tribes of southern Florida. Florida Native American Maps: Maps of Florida Indian reservations at different points in history. Florida Indian Tribes: Historical profiles of the Indian tribes native to Florida. Florida Seminole Indians: History of the Miccosukee, Creek and Seminole Indians in Florida, with many pictures. Aucilla River Prehistory Project: Online information about Paleo-Indian artifacts and archaeology in Florida. Would you like to sponsor our nonprofit work on Florida languages?